A strong appetite for pickups and booming demand in California helped drive AutoNation Inc.'s new-vehicle sales up 17 percent in July. AutoNation, the largest U.S. dealership group, sold 25,403 new vehicles in July, up from 21,650 in July 2012. 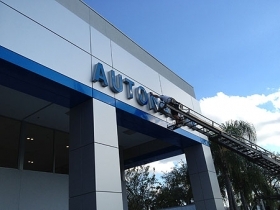 For the first seven months of the year, AutoNation's new-vehicle sales rose 11 percent to 167,115 vehicles. As a whole, industrywide new-vehicle sales rose 14 percent in July and were up 8 percent for the first seven months of the year. "At the beginning of the year we raised a lot of eyebrows" with a forecast of industry sales in the mid-15 million-unit territory for 2013, AutoNation CEO Mike Jackson said this morning on CNBC. "But we bought inventory based on that selling rate, and I'm glad we did." Pickup sales rose 27 percent in July at AutoNation stores. The retailer sold its 9-millionth vehicle this week -- a Ford F-150 pickup -- and celebrated by giving the truck to its buyer, 92-year-old Nick Gordon of Palmetto, Fla. Jackson ripped up Gordon's financing contract on CNBC this morning. Gordon, who has been buying from AutoNation since the 1990s, bought the F-150 for his auto repair business because his old truck was worn out. Sales at all AutoNation's domestic-brand stores rose 23 percent in July. Sales rose 19 percent at AutoNation's luxury dealerships. Sales rose 14 percent at the company's import-brand stores. Jackson cited the company's 22 percent gain in California as a bright spot. And a Detroit consulting firm says that state has been a relative hotbed of dealership activity. During the first six months of the year, California had the most significant dealership increase in the country, adding 20 new dealerships, said John Frith, a vice president at Urban Science, a global retail consulting firm in Detroit. "There isn't any one brand that you would pick off. There are several of them that added one or two stores," Frith said. Ford Motor Co. and General Motors closed some points in California while Chrysler/Fiat opened "a few," Frith said. Other brands were "primarily a one-dealership change," he said. California accounts for about 10 percent of U.S. retail auto sales, Frith said. And the market there is increasing, he says. "It's already a large part of the country, and so a percentage increase is magnified there," Frith said. "So brands want to make sure they are getting their fair share of the market and adjusting their retail networks."